There are some individuals who will lose everything that they’ve ever worked for, their careers, their marriage crashes, they lose everything, they go into financial despair, and are then forced to reinvent themselves. This new journey could take years to rebuild. The original skills become useful, while there’s a need to develop new ones. New risks need to be taken, while new opportunities open up. There’s a need to focus on a completely new path, one that supports your passion within your new business model. This journey of needing to reinvent yourself is never easy, it’s embarrassing, your ego becomes fractured, there will be bumps, kinks in the road, but eventually, things will become fulfilling in a variety of ways. When it comes to reinvention, there’s some who think they’re getting a mulligan in life, a makeover, a completely new start. That they get to hit the “reset” button. A new second chance that they’ll attack with more experience, vigor, and wisdom. What most are looking for is starting something new, convincing themselves that it’s easy and it will turn out successful, but this is rarely the case. This the reason why new “lessons” need to be learned, especially from those who’s previously traveled down the same path. What you need to do is find an established method, a blueprint of doing things properly. There are hundreds of examples when it comes to self-made success stories all in vivid detail. It’s found that there’s a certain precision, a way to do things that all successful people do, things which differentials them from the rest of the pack. Even if you’re not currently in the process of reinventing yourself, these compilation of tips should still serve helpful for you to achieve more success. When first starting out in life, what most will do is just follow their passion, and for the majority of times, early success is more by accident. Eventually, there’s more focus which is placed on activities which leads towards more wealth and stability. There are a multitude of good ideas, but great success often comes from a business model which has been well developed, proven, and sustainable. Everything else should be considered a waste of time. There’s no sense in trying to completely reinvent the wheel if there’s no need to. This because some industries will get completed irrelevant and become decimated. In some cases, it becomes pointless to do the same business, even if they wanted to. But what can be extracted is the ability to take the skills that’s been learned, along with the resources that you’ve built up, and then rebuilding it into a new direction, which can save you from years of testing, exploration, and failure. You will fail. It often becomes difficult after any massive failure just to get over the embarrassment, and then live to talk about it. What’s recommended however is sharing your latest failure with everyone that you know, this to the point that they get tired of hearing you. What this “sharing” will do is help you to analyze and then learn from the failure, while learning a new and better path. Some will even celebrate their failures. Then you learn to mitigate your risk, experiment and test differently, and then fail again safer. 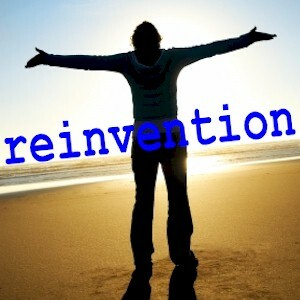 This is the quickest route to reinvention. When you’re reinventing yourself, your immediate network can never be big enough. Most likely, your existing network has the connections you need and the resources to help you some how. Meeting new and exciting people who are dynamic is just the beginning of the process when your rebranding yourself. You should always be constantly striving for bigger and better, more powerful networks which fits your new improved business model. What you want is to “Know people who happens to know people.” Also, never hide, but reveal who you used to be in the past. Always be willing to share with others when it comes to your past experiences, your past failures. Then what will slowly happen is that your success will grow from the ashes of your previous venture. Once you continue to receive more support and respect, much like you’re already successful from the start. Wear this new reinvention as a sign of fortitude, a badge of courage. What can then potentially happen is that you’ll experience immediate success which can springboard you forward. You may have previously been on cruise control, thinking you were in a safe prosperous place. But ever since you lost everything, what’s presented to you are bigger opportunities. You also no longer bother to wait for things to happen, as you learn and inquire, you realize you need to hunt for opportunities. You also filter them out more carefully while giving them the proper energy and weight, so they won’t distract you from your path towards success. Capitalizing on new opportunities comes from recognition, and not by chasing new shiny bright objects. It’s no wish for anyone’s dreams to be shattered, but looking back, it becomes gratifying to be able to achieve a whole new level in a field which fits you better. The lessons become valuable. The majority of the hardships and the pain can be can avoided by just following this path for reinvention.